Posh striker Craig Mackail-Smith is about to be clattered by Fleetwood goalkeeper Alex Cairns. Photo: David Lowndes. To be fair Peterborough United manager Grant McCann could justifiably have played nine youth team players alongside Marcus Maddison and Luke McGee in today’s League One fixture against promotion-chasing Fleetwood at the ABAX Stadium (April 14). His selection of two 17 year-old debutants, and a recall from the football wilderness of a forgotten midfielder, probably caused a few groans from the other promotion candidates from Bolton all the way down to Southend, while prompting a smile on the face of visiting boss Uwe Rosler. Posh substitute Paul Taylor battles with Fleetwood's Markus Schwabl. Photo: Joe Dent/theposh.com. But if McCann wants to plan for the future than good luck to him. It’s not as though his senior players from his captain to his highest-profile summer recruits have been delivering form that demands their selection. Anyway only those determined to dig at chairman Darragh MacAnthony (he was in fine troll-bashing form on Twitter straight after this defeat) are really concerned whether Posh finish eighth or 18th, as long as they complete a 10th-season in a row of finishing above the Cobblers. It will be League One football again next season and if Lewis Freestone turns out to be the next Adam Drury and Andrea Borg is indeed another Erhun Oztumer, a couple of chastening end-of-season defeats will prove to be worthwhile. Rapid development of 17 year-olds is a long shot though. For every Matthew Etherington (a debut at 15, a star at 16) there are three Charlie Coulsons (a debut at 16, now at Deeping Rangers) and joining a side bereft of confidence to compete against a team with plenty to play for was a task that predictably proved considerable for two youngsters who received precious little help from their experienced team-mates. Posh substitute Junior Morias appeals in vain during the Fleetwood match. Photo: Joe Dent/theposh.com. Fleetwood’s form this season has been astonishing for a team with so little pedigree and with such a small fanbase. Just 129 hardy souls travelled down from the North West coast on a Bank Holiday to support a winning team whose average weekly wage will be nowhere near the £2,200 MacAnthony forks out at Posh. They are this season’s Burton and all credit to them, even if the standard of their football in the first-half risked embarrassing a home side who employed a 4-3-3 formation which led to them being over-run. Posh ‘keeper McGee was called into action after just 15 seconds when pushing Ashley Hunter’s shot wide of a post and that pretty much set the tone for a one-sided first-half which featured two tap-in goals for Bobby Grant, assisted by former Posh striker David Ball, and Ashley Eastham, assisted by a dozing Posh back four. 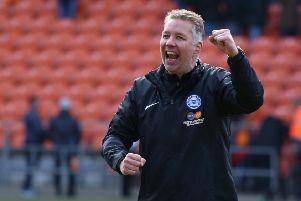 A three or four-goal lead at the break wouldn’t have flattered Fleetwood, but complacency then set in which could have enabled a better side than Posh to claim an unlikely point. Posh striker Craig Mackail-Smith collects the ball after scoring against Fleetwood. Photo: Joe Dent/theposh.com. The visitors were negative, kept slowing the game down and seemed to be preserving, understandably, energy for a much tougher assignment against Millwall on Monday (April 17). Posh didn’t exactly batter them, but once realising Fleetwood’s three central defenders lacked any sort of pace, they at least found enough encouragement to get a crowd, slightly inflated by cheap admission, interested. A remarkable burst of pace from Marcus Maddison and a superb low left-wing cross enabled Craig Mackail-Smith to convert the third goal of the day from inside the six-yard box and the same player was then denied an equaliser by a reflex save from visiting ‘keeper Alex Cairns after glancing Michael Smith’s precise cross goalwards from inside the six yard box. Mackail-Smith might also have won a penalty after appearing to beat Cairns to a clever chip from Smith, but a draw would have been injustice on the balance of 90 minutes. What promise there was for Posh arrived in the composure and ability on the ball of Freestone in the second-half, one excellent early pass from Borg which Mackail-Smith muffed and another substitute appearance full of hustle and bustle from Junior Morias. If others want to get the fans - and probably the chairman and manager as well - on side making one’s commitment to the cause obvious is a good way to start.